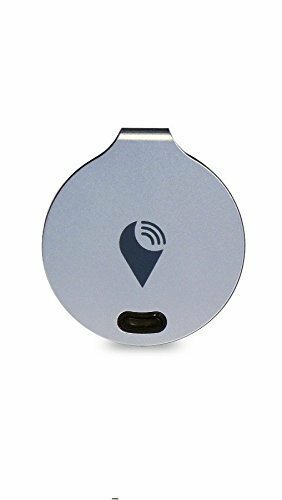 Description TrackR Bravo Tracking Device. Lost it? Find it! Connect to the free TrackR App to easily track lost items TrackR app displays the distance between you and your items, letting you know how far those pesky keys are With the quick tap of your finger, the TrackR App can ring your misplaced keys Can't find your phone? Press your TrackR Bravo's button to ring your phone, even if it's on silent! TrackrR's Crowd GPS network helps you find your lost item--when another TrackR user is within range of your lost item, you'll receive a GPS update Custom 2-way separation alert notifies you before you leave items behind TrackR Bravo uses beautiful anodized aluminum construction for the thinnest and most durable tracking device User-replaceable CR1616 battery lasts up to a year Dimensions: 1.2" diameter, 0.1" thick Connectivity: Bluetooth 4.0 (Bluetooth Low Energy) TrackR makes it easy to keep track of your things. TrackR has an app for both Apple and AndroidTM devices. The intuitive application allows you to easily track your lost items so you can always stay connected with your most beloved things. How it works. TrackR Bravo is a small, coin-sized device that easily attaches to your valuable items. With the TrackR App, locate any lost or misplaced item in seconds by ringing your missing keys, using TrackR's Distance Indicator, or via Crowd GPS. Never lose your keys (or anything) again--order your TrackR Bravo Tracking Device from Brookstone today! Device compatibility: iPhone 4s and later iPad 3rd generation and later Android 4.4 and later The Bluetooth word mark and logos are registered trademarks owned by Bluetooth SIG, Inc. and any use of such marks by Brookstone is under license. iPad and iPhone are trademarks of Apple Inc., registered in the U.S. and other countries. Android is a registered trademark of Google Inc. If you have any questions about this product by TrackR, contact us by completing and submitting the form below. If you are looking for a specif part number, please include it with your message.